How It’s New York: You hear the ethereal, gentle Celtic sound Clannad originated in every new age, spiritual bookstore and spa in the city. How It’s Irish: Clannad are an Irish band from Donegal. Clannad play New York on Tuesday, October 2, at the Concert Hall on West 64th Street, and New Jersey, at the BergenPAC on Tuesday, October 9. Full details of their tour are at www.clannad.ie. A version of this article first appeared in Irish Examiner USA on Tuesday, Sept. 25. Read an interview with Moya last March when she was touring with Cormac De Barra here, and listen to Moya on our podcast. Without Clannad, there might be no Celtic Woman. Loreena McKennitt, Riverdance, Capercaillie, The Corrs all owe something to Clannad. The family band from Donegal redefined what the sound of the mists of Ireland was from the 70s on. Moya Brennan’s gentle, breathy and expressive voice, combined with the harmonies of her brothers Pól and Ciarán and uncles Pádraig and Noel, with modern riffs from the double bass and silver flute as well as the traditional sound of the harp, created a music that seemed ethereal, haunting, mystical, even as it had a distinctive 20th-century groove. When you think of the sidhe, you probably don’t think of bongo drums and an electric keyboard. Maybe you should. Clannad brings it all together to create aural pictures that are otherworldly, beautiful, and dangerous. For the first time in over 18 years, the band is touring North America. “It’s 19 years,” said Moya Brennan (Máire Ní Bhraonáin, in Irish) with a laugh, by telephone from Dublin. Long-time fans and people not even born the last time they were here will be there together. The group will be playing a full set, with no supporting act. Jed Lynch, who also performs with Peter Gabriel, will play drums, and Ian Parker will play keyboards. 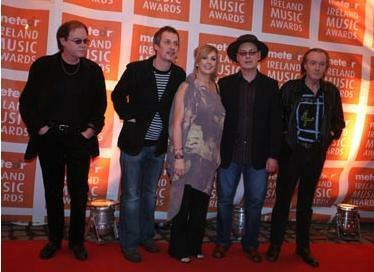 Clannad won a Grammy Award in 1999 for Best New Age Album with Landmarks, and were nominated three times. Bono sang with the band on the 1985 album Macalla. Clannad defined a sound that many people associate with Enya – and why not? Enya’s Irish name is Eithne Ní Bhraonáin, and she even recorded with the band on two albums before leaving to become a superstar. They charted with the “Theme from Harry’s Game,” a British television show about the Troubles in Northern Ireland, in 1982, and after that were featured on soundtracks including The Last of the Mohicans (1992). The band, which is celebrating its 40th anniversary this year, never intended to take such a long hiatus from touring to the states, Moya explained, it just sort of happened as time got away from them. Moya, who is the eldest of 9 children, explained that they would often sing together at occasions, or play together at her father’s pub. Her father’s pub, Leo’s Tavern in Gweedore, is where she and the family first began singing and playing together in public. “We’d sing anything from Donovan to the Beatles to Joni Mitchell to a Gaelic song, and it was all mixed up,” Moya said. Back then, traditional songs were mostly sung unaccompanied, or maybe with the harp. Harmonies, said Moya, were a “no no.” But the Brennans and the Duggans loved harmonies. People in Ireland, she said, didn’t know what to make of them. The Gaelic language kept them out of the popular scene, and the instrumentation puzzled purists. So they went to Europe, where nobody spoke their language anyway, and the people, she said, loved the sound they created. “When we got together, we weren’t trying to become famous and rich. We were surprised when we were getting paid for what we were doing, because we were still at school,” she said. They arranged songs they’d learned from their grandparents when they set out. Moya’s mother was a music teacher, and there were always instruments around the house, she said. Her father was in a showband. When the band stopped touring they were on a high: their last album, Landmarks (1998), had won a Grammy, said Moya. The two before it, Banba (1993) and Lore (1996), had also been nominated for Grammy Awards. They had made 17 albums, including, Moya said, and it just felt like a good place to pause. Touring wasn’t something the band would do just for the sake of doing it, Moya said. Clannad always did what felt right, even if it got them criticized, as was the case when they made Legend (1984), the soundtrack to the British show Robin of Sherwood, making songs about an English folk hero in an album without a Gaelic song on it, she said. Legend went on to win a BAFTA Award for Best Original Television Music. “We didn’t realize we would stop for so long,” Moya said. Her brother Pól had left the band in 1990, also, and had not been on the band’s last three albums. But then a year and nine months ago, the full line-up came together for a trad fest in Dublin, and played at Christ Church cathedral. The recording of the show went out on PBS. “That was really when the seed took place,” Moya explained. The new album isn’t finished yet – when it is the band will probably tour with it again. “After not having an album out for so long, it was really important that we felt happy about it. But the music hasn’t really changed. “I don’t think it’s dated,” she said. We agree. Their music is timeless.